So, I was browsing the iOS App Store today to look for some new apps to play around with. I went to see the Top Paid category, being curious what my fellow Malaysians are paying their hard earned money for. 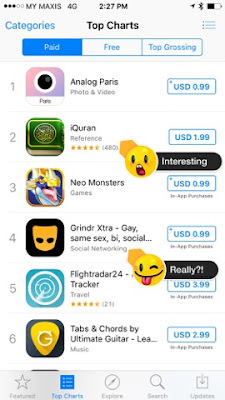 Imagine my surprise to see a gay boy social networking app, Grindr, being the number 4 top paid app. And ironically, number 2 is a Holy Koran app. Holy Koran being number 2 is not a surprise, Malaysia being a Muslim country and having majority Muslim. Also this is the holy month of Ramadan. But the contradiction between the gay app and the religious app is just too glaring!! What does it mean? We have a lot of gay people in the country? Malaysians are known to be cheap skate. People usually pirate software or they jailbreak their device. And yet, we see people paying for gay app. Perhaps, the Apple owners, known to be owned by more affluent consumers, are majority gay boys(*)? This is interesting! Let's discuss! (*) The reason I said "gay boy" instead of "girl" is because when you clicked on the app and look at the screenshot, it's mainly photos of good looking boys/men.